your review. This is an Audi with Punch and Performance! 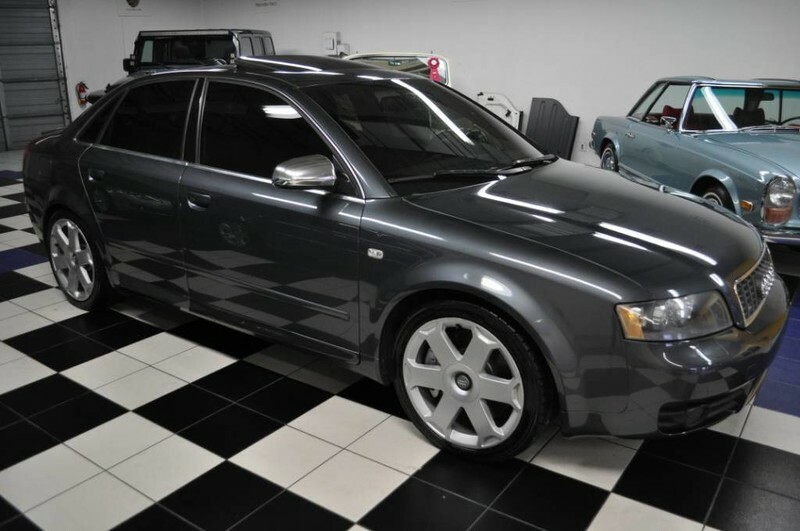 This S4 is loaded w/options and features, has a smooth as silk 6-Speed Transmission and is in an overall condition that is impressive. This is a great opportunity to own one of Audi's best! 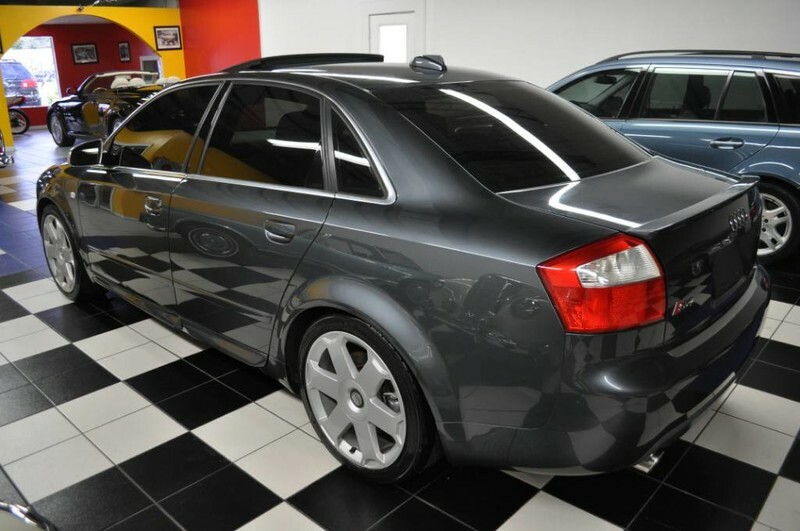 Our numerous untouched photos will show you inside and out just how nice this S4 Sedan really is! You will appreciate this S4 having the most desirable color combinations! The Dolphin Grey Metallic has maintained a deep.rich and mirror-like high gloss like the day it left the showroom and the laser straight lines define the unique design that has made this series so popular. 18" 6-Spoke Forged Alloy Wheels completes the stunning exterior look on this Sedan. The interior seating is an Ebony Premium Leather that is soft and supple, yet very durable and has no rips, tears or stains. Dark Burl Wood Inlay surrounds the cabin in luxury and is stunning. Fingertip control for the many options and the many features makes any trip, long or short, a total pleasure. This is a great opportunity to own a great Audi! With no interior smoke odors, we assume a previous non-smoker. This S4 has so many great options and features! Dual-Zone Automatic Climate Control, 6-Disc In-Dash CD Player, Audi Navigation System, Premium Package, Infotainment System, HID Headlights, Bose Premium Sound System, Quattro Permanent All-Wheel Drive, Power Moonroof, 6-Speed Manual Transmission, Heated Front Seats, 18" 6-Spoke Forged Alloy Wheels, XM Satellite Radio (Sub. Req'd. ), Light Sensor Package, Homelink Universal Garage Door Opener, Audio Telematics by OnStar, Auto-Dimming Rearview Mirror w/Compass, 12-Way Power Front Recaro Front Sport Seats, Silk Nappa Leather Seating, Drivers Side Seat Memory and Mirrors, Electronic Cruise Control, One-Touch Down Power Front and Rear Windows, Central Locking System, Concealed Headlight Washing System, Genuine Beltline Trim, Three-Spoke Leather Steering Wheel, 60/40 Split Folding Rear Seat, Child Safety "LATCH" System, Power Heated Outside Mirrors, Front Fog Lights, Single Rear Fog Light, Immobilizer III Transponder System, 12-Volt Trunk Outlet, Rear Window Defroster, Anti-Theft Alarm System, Tilt and Telescopic Steering Wheel, Dual Illuminated Visor Vanity Mirrors, Remote Trunk Release and much more. SIDEGUARD Inflatable Curtain Airbags, Power 4-Wheel Anti-Lock Disc Brakes with Electronic Brake Pressure Distribution, Side Intrusion Beams, Child Safety "LATCH" System, Rear Child Safety Door Locks, Impact Protection with Reinforced High Strength Steel/Aluminum Crossmembers, Reinforced Bumpers, Rigid Occupant Cell, All-Wheel Drive and so much more for the safety and well being of you and all of your loved ones. Will you guys change my timing chain if I buy it? I'll give you $100. A friend of mine had one of these. I was very impressed with the acceleration. It would shove you back in the seat hard as long as you kept the revs up a bit. It didn't seem to have much low end torque but mid range and higher rpm it hauled. The only downside was the fuel economy. He said he could see the gas gauge drop by the minute when he drove it hard. Also on the highway even in top gear it was running about 3500-4000 at 70 mph. So he got almost the same gas mileage on the highway as in the city... Too bad because it was fast, handled well and had a nice interior. He just had a long commute and the fuel cost was killing him even when he drove it gently so he had to sell it. Wait are they offering $10k for someone to take it? I'll still pass. I'm done with Audis.